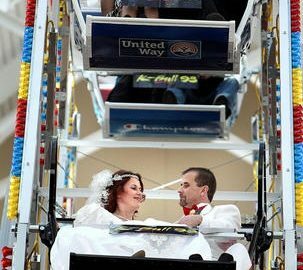 From hundreds of online applications, a few lucky couples were chosen to have their weddings on a 65 foot ferris wheel in Sandy, Utah on Valentine’s Day. The wedding ceremony was performed by Murray Mayor Dan Snarr. Radio station K-Bull 93 and Scheels sponsored the wedding ceremony on a ferris wheel at Scheels on Thursday, Feb. 14, 2013. What do you think? Would you participate in this circle of love? ?